Breasts come in all shapes and sizes, and some individuals may choose to undergo procedures to alter the aesthetic of this prominent facet of their physique. Augmentation, in particular, is one of the most popular cosmetic surgeries performed nationwide, totaling more than 300,000 in 2017, up 3 percent from the previous year. For those looking to increase the volume of their breasts, there are numerous options to consider, from the type of implant to the specific placement and incision used during the process. As this is an extremely personal decision, it’s important to evaluate whether such a procedure is right for you. Consulting with a board-certified cosmetic surgeon is integral to learning about the surgery itself, the recovery process, and the results you can expect to see. The following is a guide to each type of breast augmentation surgery, and the choices available, depending upon a patient’s unique situation. Implants come in several varieties, the most popular of which are saline—filled with sterile saltwater, and silicone—comprised of silicone gel. Saline typically requires a smaller incision, as these implants are filled after surgical placement. Silicone, by contrast, comes pre-filled, and so necessitates a slightly larger insertion point. Gummy Bear implants, made up of a thicker, gummy-like gel, have grown in popularity in recent years for their ability to maintain shape. For those seeking a more natural substance, fat transplantation enables patients to utilize excess fat extracted from other areas, although this can lead to inconsistent results as the fat shifts and settles over time. It is important to discuss with your surgeon the best placement alternatives for your particular body and implant type. Subglandular placement occurs under the breast tissue, above the pectoral and chest muscles. Partial subglandular sits beneath the breast tissue, partially under the pectoral and chest muscles, while full subglandular is fully submerged beneath both the pectoral and chest muscles. Since this is a major surgical procedure, a degree of scarring can be expected, yet another facet for patients to consider when discussing their options with their cosmetic surgeon. Inframammary incisions are made under the breasts, within—or just above—the folds, and typically leave a 1- to 2-inch scar. Periareolar incisions are focused along the edges of the areolas, and serve as a more inconspicuous choice for those looking to limit visibility of any scarring. Transaxillary incisions, while also hidden in the underarm area, can, in certain instances, create the potential for implants to be uneven. 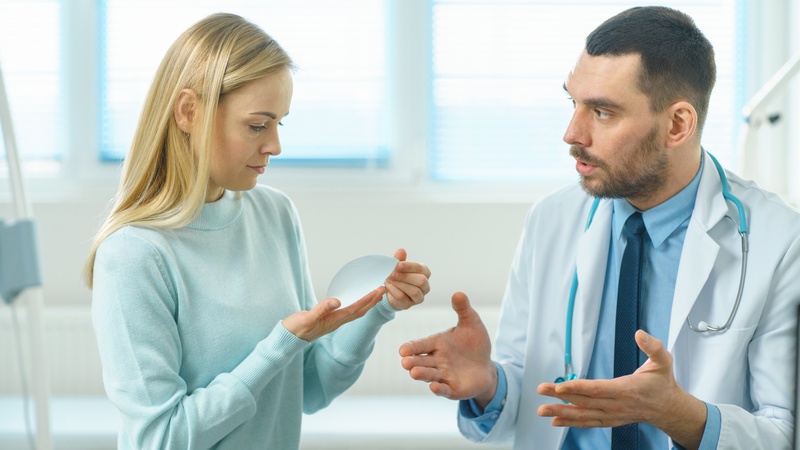 When determining if breast augmentation is right for you, it’s important to consider the process, its intentions, and to evaluate these facts alongside your personal expectations. The procedure is designed to increase size, as well as adjust the shape and positioning on a woman’s body frame. Some turn to augmentation to restore volume lost due to pregnancy, breastfeeding, or extreme weight loss, while others desire to even out asymmetries in size and shape. As a rule, patients must be at least 18, as breasts are finished developing at this point. Ideal candidates are those in good health who embody an equally positive mental outlook. Be sure to thoroughly discuss the procedure, along with options for type of implant, size, incision, and what your ultimate expectations entail. While the surgery itself generally takes about one to two hours to complete, it is important to be prepared for a lengthy recovery process, as the pain and swelling gradually subside over time as the implants begin to settle. As anesthesia is required, driving is prohibited immediately following the surgery. Recovery is affected by a host of factors, including the location of the incision, the size of the implant, and whether it was placed above or below the pectoral muscle. Additionally, a patient’s age, overall physical condition, and the elasticity of his or her skin can come into play. In the days and weeks after the procedure, a support bra and bandages will be worn to limit movement, minimizing any additional stress on stitches. It is recommended that patients sleep on their backs at the beginning, or at least until the bandages are removed and any remaining stitches dissolve. It’s also advisable to avoid hot showers, direct sunlight, smoking and alcohol, and to stick to a healthy diet. Post-surgical breast implant massage, as well, is an integral part of the healing process, as it helps to break up any scar tissue that may begin to form. To properly prevent this from happening, patients should apply gentle pressure to the skin, shifting the implant down and away. This process should be repeated for about 10 seconds, on each breast, daily, for one to two weeks. Researching your cosmetic surgeon is essential to ensuring the breast augmentation procedure goes as smoothly as possible. When beginning the process, don’t hesitate to make several consultation appointments, as most surgeons will offer a complimentary sit-down. During these meetings, it’s important to compile a list of questions to ask, from general information about the procedure and your options, to specifics about the facility and the doctors who will be performing your surgery. It’s perfectly acceptable to ask to meet the staff and view before-and-after photos of previous procedures performed, as well as inquire about both the doctor’s and anesthesiologist’s respective levels of education, training, certification and experience. Prospective patients should find out what the average volume of surgeries for a particular facility is, who will be on hand in the operating room, and a detailed list of expenses—from any pre-testing and lab work, medications needed pre- and post-op, the implants themselves, along with the cost of the facility, additional charges for anesthesia, surgical dressings, and more. Board-certification is crucial, and any cosmetic surgeons you may be considering should be certified by the American Society of Plastic Surgeons, a standard that requires four years of college and four years of medical school, followed by six years of surgical residency. A Fellow, American College of Surgeons designation is also desirable, as this indicates the surgeon in question has passed rigorous evaluation by the American College of Surgeons. The facility, as well, should be accredited by the American Association of Accredited Ambulatory Surgery Facilities, which ensures it meets hospital standards for safety and practice, and that surgeons who operate onsite hold hospital privileges.